Florida's only NAPSA-Certified company offers over 40 years of experience. Doug joined his father's operation in about 1987, becoming president in 1995 when Ray retired. Unfortunately, Ray passed away in 2004. For a number of years Doug's wife, Kim, was involved in the business as well. Today, however, Kim is primarily occupied in raising the next generation in the Swatkowski sweeping family. Two of the Swatkowski brothers also entered the sweeping business by starting contracting companies of their own. 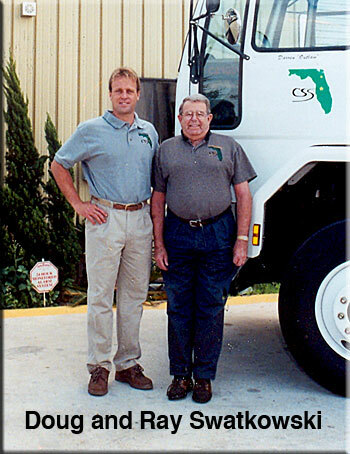 Brother Jeff is owner of North Florida-based, Jacksonville Surface Management, while brother Dave heads up Tampa-based, Central Parking Lot Maintenance. Under Doug's tenure at the company, the business has grown substantially. Today, Central is a large player in the Central Florida marketplace, and does all types of outdoor sweeping. In addition to having 40+ years of experience in the business, Central's management has done what it takes to become NAPSA-Certified. To date, they are the only Florida-based company to do so, a singularly important addition to the company's resume. Also taking part in the audio interview is Brian Oxtal, who for the last nine years has been Central's operations manager. In it, Oxtal offers up some reasons why Central has been able to stay competitive over time. Swatkowski and Oxtal are fixtures at the yearly National Pavement Expositions, always looking for better ways to operate their business. At the show, they not only attend seminars to learn the latest about techniques and equipment, but are also among those savvy contractors who burn the midnight oil in productive bull sessions with other industry professionals. As you will hear in the audio interview, Swatkowski credits his success in a very competitive marketplace with, primarily, the company's emphasis on being customer-centric. That, he says, is the most important factor. They have also been able to keep costs down via a number of methods, foremost perhaps being keeping their employees happy and, so, more productive and -- you guessed it -- customer centric. In an area where probably 75% of contracts are given to the low bidder, price competitiveness is also very important. Note: The following audio interview with Doug Swatkowski and Brian Oxtal is approximately 11 minutes in length, and will play without downloading any files onto your computer. If you hear the interview at 'chipmunk speed,' you will need to download the latest version of Adobe's free Flash player. More information about Doug Swatkowski, and his sweeping company, may be found at: www.floridasweeping.com. Swatkowski may be reached via email sent to doug@floridasweeping.com.